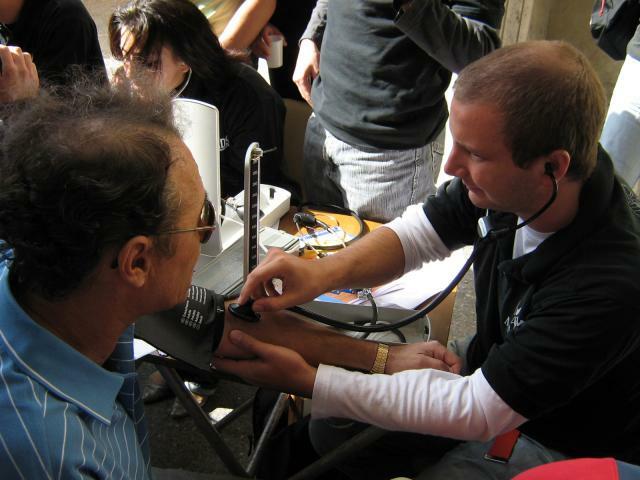 Carmen asks: What do the numbers in a blood pressure test mean? Also, what types of things do these numbers tell doctors? Well Carmen, blood pressure is really just that- the pressure at which blood moves around the body in your arteries. The easiest and least invasive way to test what that pressure is at any given moment is to momentarily stop the flow of blood and then slowly allow it to begin again. The pressure at which it begins to flow is the highest pressure the blood exerts on your artery walls. Medical professionals do this by using a blood pressure meter known as a Sphygmomanometer (say that three times fast while eating peanut butter!) They encircle a limb, usually an arm, with a balloon-like device known as a blood pressure cuff. While pumping the cuff up, they use a stethoscope to listen for your heart beat past where the cuff is cutting off blood flow. When they no longer hear your heart beating, they slowly release the pressure while watching the pressure gauge. When they start to hear your heart beat again, this is the top number of your blood pressure, known as your systolic pressure. They continue to release the pressure until they once again, no longer hear the heart beating, this is the bottom number of your blood pressure, known as your diastolic pressure. Together these numbers tell them two things: the pressure that is inside your arteries between heartbeats (the bottom number) and the pressure inside your arteries when your heart squeezes (the top number). This information gives doctors the ability to assume several things about what is going on inside the body- things like how well the heart is working, is it working too hard or not hard enough, and is the pressure a factor in the symptoms a patient might be having? Different disease processes like coronary artery disease can cause higher than normal blood pressures. Lower than normal blood pressures can be a sign of other disease processes like septic shock (shock caused by infection). The difference between your top and bottom numbers, or a change in that difference, can also point to specific problems like cardiac tamponade (too much fluid around the heart, not allowing it to work properly). Combining this information with a person’s heart rate can also tell them about numerous other things that could be going on. If you’ve been in a car accident and have a lower than normal blood pressure and higher than normal heart rate, you could be bleeding internally and require emergency surgery. If you were in that same car accident and have an extremely high blood pressure and a low heart rate, you could be bleeding in your brain and also require emergency surgery. So when it comes to what these numbers mean, it’s really just plumbing (chemistry mediated plumbing)- the pressure exerted on the inside of your arteries by your blood, which is put there by the pump known as your heart. Don’t let doctors make it any more complicated than that. Although, what you can do with the information can be very complicated! High blood pressure is not a disease or illness in and of itself. It’s merely a risk factor for other problems. For instance, if you have chronic high blood pressure, your risk of having a heart attack or stroke goes up significantly. This high pressure could be caused by excessive plaque on the inside of your artery walls, making those arteries in effect, smaller. Think plumbing again. When the pipes that transport fluid get smaller, the pressure that same volume of fluid exerts goes up. What happens if your blood pressure gets too high? I’ll answer that question with another one. What happens if the water pressure in your houses pipes gets too high? Your pipes burst. Same thing here. Should your blood pressure get too high, your arteries have a greater chance of bursting. If there is too much gunk inside your pipes (plaque inside your arteries), that ball of gunk could get too big and clog off your pipes! Seems bad too me! Especially, if those arteries are in your brain, or heart. It’s not like kidneys, where you have two! You spring a leak in those organs, and your family finally gets that big paycheck from your life insurance policy! Not really the best way to get paid, well, unless you’re really a jerk and everyone in your family hates you! The first known experiment to measure the exact pressure of blood was performed by Stephen Hales on December 1, 1733. He took a live horse. Attached a tube to her left crural artery., then allowed her blood to rush through the tube and it rose to a height of 8’3”. He noted that “when it was at its full height, it would rise and fall at and after each pulse 2, 3,or 4 inches”. Yes the horse bled out, but don’t think Mr. Hales was too cruel, he performed the experiment on a horse that was about to be put down anyway! 1. The cuff is pressurized to a level where the blood flow is completely stopped at that point of your arm. . . i.e. it is at a pressure higher than your systolic blood pressure. Systolic pressure is the highest point of your pressure in which the heart is actually pushing blood out or contracting. 2. As air is let out, the pressure in the cuff eventually reaches a point at which it is less than the systolic/contractile pressure BUT it is not lower than the diastolic/relaxing pressure. This results in blood flowing through during contraction and being cut off during relaxation. This causes the snapping sound that we hear from this point. 3. Enough air is let out that the blood is able to continue flowing continuously during systole and diastole. As would be expected, the snapping sound disappears at that point and so we are able to mark this as the diastolic blood pressure.